Mixed at The Village; Santa Monica, CA. and Points West Recording; Silverlake, CA. 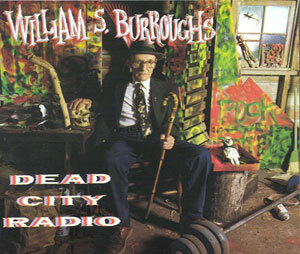 The first time that I encountered William S. Burroughs was in November 1981. I was working a second season as "music coordinator" for "Saturday Night Live". Nelson Lyon, Michael O'Donoghue and Terry Southern, who where involved with the show that year, booked Burroughs to read selections from his works. I was twenty-five at the time and for some reason had only heard of Burroughs. I'd never read any of his books. After witnessing his reading (passages from "Naked Lunch" and "Soft Machine"), I bought about five of his books and attempted to read them. Everything about Burroughs fascinated me; his reinvented language, the mesmerizing power of his voice. Being responsible for the background music on the show, I had the job of putting an old recording of "The Star-Spangled Banner" behind his reading of "Twilight's Last Gleaming". We wanted the anthem to finish naturally as Burroughs completed the text, so I timed him reading the piece twice – and he was consistent. On the air, he sped up his delivery (live TV often does that to people) and the music "almost" finished. To this day, when I see that clip (which opens Howard Brookner's documentary on Burroughs), my stomach turns when I hear that music not quite end. Anyway our National Anthem worked well – the contrast was perfect. It presented a vision of dark Americana. In August 1987, James Grauerholz and Bill Rich organized the River City Reunion in Lawrence, Kansas. What started as a small festival at University of Kansas, where Allen Ginsberg, Anne Waldman and Andrei Codrescu would read and conduct workshops, became a huge reunion of poets, musicians, writers, artists and film makers, with events taking place all over the city. I had recently produced Marianne Faithfull's "Strange Weather" LP and was currently recording Allen Ginsberg for what was to become "The Lion for Real". Both Marianne an Allen were part of the River City Reunion. Allen was very happy with the way our sessions were going and felt that we should start a series of spoken word/music albums. 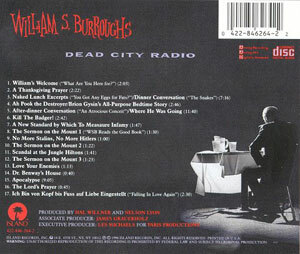 He's suggested that an album with Burroughs should be the next project. One afternoon, I accompanied Allen and Marianne to the Burroughs home to meet WSB and an album discussed briefly. Right before attending the festival, I was visiting Los Angeles and mentioned to writer/director Nelson Lyon, who I had worked with on SNL a few years before, that I was going to the River City Reunion, though I couldn't describe what it was exactly except that it was in Burroughs' home town, and that the whole "mishpachah" was going to be there. After I left, Nelson spoke to Timothy Leary who happened to mention that he was also going and Nelson decided that he didn't want to miss this blessed event and accompanied him. Running unexpectedly into Nelson in the hallway of the local inn was perfect. I thought it would be great if he were involved with the album. James Grauerholz loved the idea of the record, William was amenable. Finally and crucially, Michael Minzer (Executive Producer of the Ginsberg record and this series) got excited about the idea and moved it along. Now it became concept time. I thought about William on "Saturday Night Live"…the image of a true and great American writer with "The Star-Spangled Banner" behind him…a timeless album that would sound as if it could have been recorded tomorrow, or forty years ago. I invited Nelson Lyon to be co-producer. Then I made a proposal for Paris Productions and Island Records. And then we had to get to work. On December 12, 1988, Nelson Lyon and Michael Minzer and myself arrived in Lawrence, Kansas with a portable DAT machine (Digital Audio Tape) to record WSB. We came with no script. For three days and nights we improvised the first sessions; recording William reading from his lecture archives; lose conversations; various poetry; selections from some of his better known works. In fact, every word of WSB on this record was recorded in his home. On December 15, we left Lawrence. For the next five months, Nelson and I listened and shaped the more than ten hours of WSB tape. Or rather we let the tapes shape themselves. During this process, Nelson discovered the WSB "Apocalypse" text, the just-published "Tornado Alley" stories…including the "Thanksgiving Prayer"…and other WSB work that belonged on this record. On June 24, Nelson and I returned to Lawrence, to William's home. We had our second session. Back to edit. Our first edit was three hours. Our second came to one. What you have now is our third edit – with music. Most of the music on the record was recorded about thirty years ago by NBC Symphony Orchestra. I've been aware of these recordings for about ten years. The more I worked with the Burroughs' tapes, the more I realize authentic American music was needed and the NBC Library was perfect. The rest of the record was filled out with wonderful contributions from John Cale, Donald Fagen, Cheryl Hardwick, Lenny Pickett, Sonic Youth and Chris Stein. The result is a dream to visit to William's home. Most of all thanks must go to James Grauerholz who understood and therefore created the atmosphere and perfect involvement that made this album possible. To Allen Ginsberg who instigated the process – thank you (I guess you never learned). Thanks to Sally Grossman for her enthusiasm and support; to Chris Blackwell and Kim Buie for letting these albums out of the cages; and to WSB, for letting us into your life with our evil-looking tape machine – thanks. I hope the album doesn't make you want to take us out to Fred's place and feed us to Rocky. A final word from Nelson and me: when you listen to the voice, let the voice listen to you.